Emily Schuman used it to dress up a large wall in her home office. 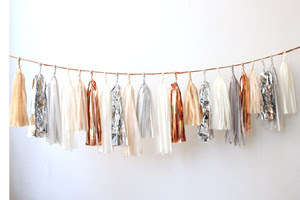 Love the way the colors of the tassels play on the ballet pink walls. However, given the rather staggering price tag of $130 (makes sense given every order is hand made) I think I may attempt to replicate it myself. The tassels are made out of tissue paper, how hard can it be? Famous last words. I'll let you know.